Winter is just around the corner, which means snow plows will soon be back in action. A few best practices will help you plow as efficiently as possible, even as snow continues to fall. Before it snows, survey the property you’ll be plowing to check for obstacles—such as speed bumps, curbs, sidewalks, shrubs, fire hydrants and fences—that may become hidden by fallen snow. When plowing in dirt or gravel, lower the plow shoes. This will raise the blade to prevent scraping away the surface. When plowing on asphalt or concrete, raise or remove the plow shoes to scrape as close to the surface as possible. If a significant amount of snow is expected, plow with the storm rather than let snow accumulate. Never pile snow on someone else’s property, on streets or sidewalks, in handicap parking spaces, or on top of any structures. Be sure not to impede mailboxes, dumpsters, water drains, electrical boxes or fire hydrants. Never push snow across a road without first checking the local regulations. Be aware of federal requirements for front and rear weight distribution and make sure your vehicle has the proper amount of ballast. Ballast should be placed rearward of the back axle toward the tailgate of the vehicle, and should be properly secured. 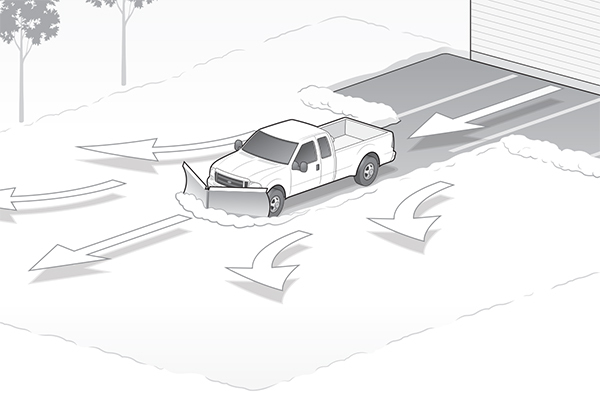 Follow the steps at right to effectively plow a parking lot. Plow areas in front of buildings and doors first. 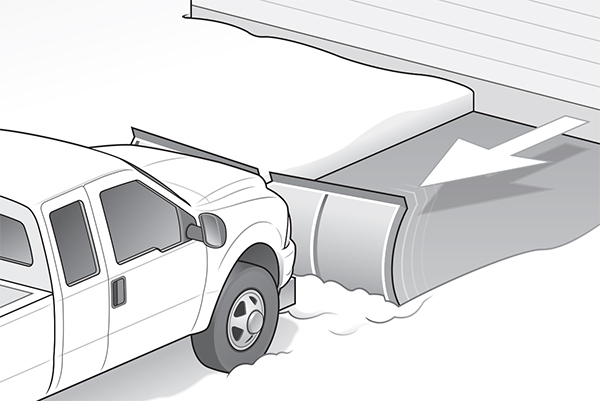 With the plow blade raised and in the straight position, drive up to the building, drop the blade and pull the snow away from the building. 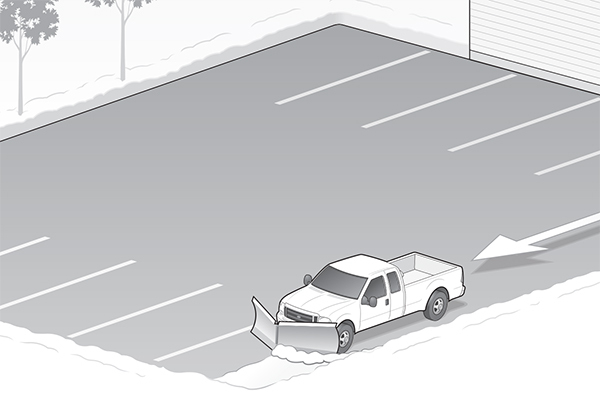 Turn your vehicle around, back into the cleared area, and push the snow to the far outer edges of the lot. After back dragging snow away from the building, start plowing the lot. Make a pass down the center of the lot, and then push snow to the outer edges. In large lots it may be best to break down the lot into smaller areas. Pile snow downwind to minimize drifting. Once the majority of the snow is removed from the lot, do cleanup work. Start by plowing next to curbs. Be sure to square off corners where possible, and don’t leave trails of snow behind. To download a PDF copy of this page of the magazine for your own training program, click here.